Written on February 8, 2017 - posted now. If you know me well then I'm going to show you just how important the number 57 is in my life. It is my favorite number and continues to appear in many ways. It was exactly 57 weeks between when I left the workforce to be free to travel to when I have made the return back to the workforce. In those 57 weeks, I gave myself the gift of complete freedom. Zero responsibilities besides waking up, being present, grateful, and shining my light. Living by those rules was the guidance I needed to embark on my grand adventure. Taking time for myself to live without responsibilities was everything I needed it to be. I love that I got to experience what it feels like to travel open ended and allow any journey to unfold. I'm a person who chases feelings. I love to feel new things. I've always been one to put myself in challenging situations simply to see how I react. Its a true testament to my character when it turns out well. Proof even that I'm allowing the journey to unfold as it should. I'm not attaching emotions to the outcome. I'm living in the present feeling. Life unfolds for us when we do this. The concept of time means something completely new. Our feelings of how we feel is the main driver to the actions we take. Isn't it so simple? If something feels good we should do more of that. If something feels bad we should do less of that. Such a simple concept but when you add in all the factors of life that are constantly thrown in the mix it makes the simplicity such a challenge. Anyway, I am rambling. Moral of it all - 57 has always been my good luck charm. 296 days and I'm back home! Yes, I did make two quick stops home from my departure date on December 7, 2015 but they weren't longer than a week so I am finally able to soak in the feeling of being in one place. What a whirlwind of emotions I feel from traveling for so long to now being back home. I have been on the go since leaving in December. I have done the coolest things and its finally time to fully process it, instead of moving to the next activity. I am constantly asked whats been my favorite part so far.. That is a hard question. If you know me then you know everything is my favorite. I have so many favorite places but if I HAD to narrow it done then I would say my three favorite places visited were Colombia, Vietnam, Laos & Norway. That is not to say the other countries weren't as great but the experiences I had in these places are indescribable. Colombia was the start of it all. The first time where I got to be the traveler I always dreamed of being. I didn't have a plan. I let my time unfold as it should and the friendships I made and places I went will always be with me. Working at a hostel for my first time in the jungle is a travelers dream. (The above was written on October 4, 2016) - I never got around to finishing a lot of my writings so I am doing that now and posting them late. Vietnam has been high on the list so to finally experience it and soak it for an entire month was everything! The food, culture, history will always stand out to me. I look forward to going back and exploring more. Laos is hands down the most beautiful country! It is so lush, so green, so beautiful! My eyes would happily stay here and soak in the beauty daily if it could. Norway is where dreams happen. My bucket list was filled with places to visit in Norway and even though I had knew of these spots, actually going and experiencing it was better than one could imagine. If you ever have the chance to visit Norway, please say yes! 2016 has been one of the best years of my life. I set out on an adventure to travel around the world without a plan, and it couldn't have unfolded better. Check out my video for a preview of some of my highlights from this year. (Thank you Sara for the edits). I am so grateful to have taken this time to be completely free to live out my wildest dreams. From teaching yoga around the world, to facing my fear of heights, to nonstop adventures, to the friends I made, to making checks off my bucket list, I am so in love with the adventure that is life. Thank you to all the friends I met on this journey and the everlasting memories. I am happy to say I have gotten my wanderlust out for a bit and am settled back in San Francisco. I look forward to what is to come and welcome it with open arms. I am excited to get back in the workforce and be challenged in new ways. Life is the greatest adventure of all. Cheers to the best year yet. Happy NYE everyone! The adventure isn't over yet, I will be spending the next two months traveling around Europe. I plan on making a video at the end of my travels with videos of my adventure. Thanks for following along! I made it to my 30th country, one that has always been high on my list to visit. Australia, you're wonderful, and I enjoyed every minute of my visit. I know I will be back to work for a period of time. My time in Australia flew by. One of my best friends, Kayla, did a solo trip through SE Asia and ended up moving to Australia. Seeing her was one of my main reasons for going to Australia when I did. Kayla left for her trip the same time I left for India in 2015. Her original plan was to travel around SE Asia for three months, but fell in love with an English man, Josh, and the two of them moved to Australia. They dedicated a year to working hard and saving all their money for another travel adventure. I returned home after 7 weeks in India, and remember being so envious of Kayla and her continued adventure. When I first met Kayla, I wouldn't have expected her to be the woman she is today. I admire her for taking a leap of faith and getting rid of everything to travel. She knew what she ultimately wanted and has found it in her travels. Watching Kayla's adventures unfold after I returned back to work was an inspiration for me. It was the motivation I needed to do the same. I am proud to be her friend. She shines brighter now than she ever has and is living life to the fullest. Because of this, I knew I had to go to Australia to see her. Kayla and Josh were wrapping up their last month of work when I arrived. It was fun to be with them during the transition of getting back to the travel life. Since Kayla and Josh worked opposite schedules, I got to spend quality time with both them. Meeting Kayla's mystery man was great. Josh is laid back and easy to get along with which made me really enjoy our time together, not to mention he loves yoga. Before they wrapped up work, I found a yoga Ashram outside of Sydney to volunteer at for a few weeks. Finding yoga Ashrams along my travels is the one thing that makes me feel most grounded. I love being part of a yogic community where judgement does not exist. Although the daily routine was long and left me exhausted by 8:00 pm, I craved the routine and lifestyle. I felt so welcomed and loved the moment I arrived. I stayed at Mangrove Ashram for 11 days. There was no wifi at the Ashram, so I got to completely disconnect for a bit. Not having my devices or having to come up with a daily routine freed my mind and allowed me to be completely present. It was magical. 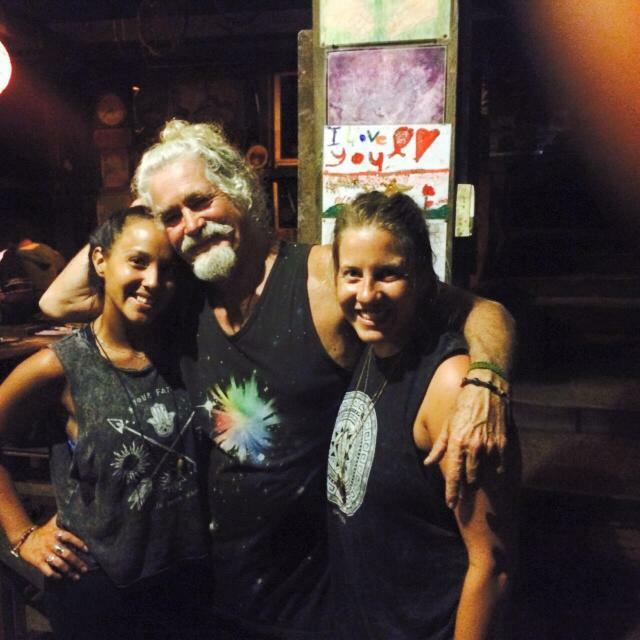 I cherish my time at Mangrove Ashram and left with some incredible friendships. One of the girls I met, Jean, has instantly become a life-long friend. I can already see the reason why the universe brought us together. You see, Jean is very into meditation, and her dedication to a two hour daily practice was inspiring for me to be around. Not to mention, we have the same sense of humor. My perfect Jean has completed three Vipassana courses (10 days of silence) which is something I've been wanting to do for awhile. Jean's presence in my life came at the perfect time because I've been debating on signing up for a course, and now I know my time is coming soon. Besides meditation, Jean is a traveler and free spirit like me. I'm looking forward to the day we meet again, wherever that will be. The most challenging thing I have faced while traveling is my desire to be a vegetarian vs. the reality of actually being one. I have let eating chicken slide quite a bit. I am not okay with the poor treatment of animals and being a vegetarian makes for a more sustainable world. So, in a perfect world, I would actually be vegan. But, that being said, I love the taste of meat and it's hard to work around this when you aren't around other vegetarians, esp as the newbie that I am. I am not the type to beat myself up over this. So I've decided to continue to eat vegetarian whenever I can, and be okay when I can't. It's the best of both worlds, and I know I'm still making an impact by cutting back the way I have. It's crazy to think about how much I used to eat meat and how little I do now. I would love to hear advice from anyone who has gone through this transition themselves and any tips they might have while traveling? I'm over the label of calling myself something based on what I eat, but I want to continue to be mindful about the topic. Before coming to Australia, Kayla had mentioned that her and Josh wanted to get a camper van and do a road trip up the coast. When I arrived, their original plan fell through and the person they were getting the van from sold it. The cost of getting our own van wasn't in the budget, so we were stuck trying to come up with a plan of how to see more of Australia before we left. We had found cheap flights to the Philippines and booked them out of Brisbane, so we knew we had to make the 9 hour trip up the coast. The question became, how can we do this the cheapest way possible? Once again, the universe aligned in our favor. Josh's friends from home, Fiona and Fran, were selling their van and found someone to buy it in Brisbane. It couldn't have worked out any better since we needed to be in Brisbane to fly out. Our road trip dreams became a reality, and we got to take Venus on an adventure up the coast. Let me just say, this road trip is one of the biggest highlights of my life. I think everyone should rent a van and go on a road trip once in their life! Something about having your home on the go and not knowing where you will be staying each night is so freeing. Each day is a completely new adventure. We had a kitchen on the go and were able to make food wherever we wanted. There were countless mornings where we parked at the beach and made breakfast while the guys surfed in the ocean. Not only did we save a ton a money, but we got to appreciate how little you need to be happy. I am grateful for the countless free campsites Australia offers. In our 12 days, we only paid for accommodations 3 of the nights. Two of those nights were spent at the Rainbow Temple outside of Byron Bay. This place was magical. It felt like a second home the moment we arrived. For $30 AUD ($23 USD) a night, it included our food and bed in a tree house. The unique thing about the Temple is you do not call ahead for reservations, you simply show up. The guy who started it had a vision to create a community where anyone can come and contribute. It is constantly a work in progress and evolving. My favorite part about the Rainbow Temple are the tunnels. Guy has spent the past 20 years digging out tunnels and a room underground. Walking through the pitch black tunnels lit up by glowworms was one of the coolest experiences. The glowworms lit up everywhere and it felt like we were looking up at the night sky. I don't know how to explain the high you feel when you are inside, but it is next level. When we made our way to the room we did an Om circle and all connected on the same vibration. It was pure magic and love. It is so humbling to feel the oneness of all beings. If you ever make it to Byron Bay, be sure to stop by the Rainbow Temple for a night. I can't believe I've gone this far without mentioning the stars at night. Each night the sky showcased the Milky Way and more stars than I've ever seen. Australia wins for the best night sky. The beauty of the universe was a constant reminder how lucky I am to be alive and grateful for this adventure. Kayla, Josh, and I traded off sleeping in the van and tents throughout our road trip. But, as comfy as the van was, sleeping outside in a tent was the real winner. The places we camped along the way were incredible. Check out the review below to learn more about the places we stopped along the way. I'm happy to have experienced Australia through the life of a van. I look forward to the day I return and work in this beautiful country. I am very behind on blogging. For those of you following, my Instagram @megspire is the best way to stay up to date with where I am and what I'm doing. Hot! I came for the tail-end of their summer and beginning of Autumn. I experienced a few days of rain. Join the Facebook group Australia backpackers to meet like minded individuals and have the option to travel with others. This is the most helpful group if you have any questions about traveling around Australia. For the travelers budget, Australia isn't the cheapest place to go, but there are ways to make it cheaper. To give you an idea of how expensive it is: a cocktail out is $17 AUD ($12USD). While this might sound okay to some of you, I am not okay spending that much on a drink with 30 ml of alcohol. Another example: avocados ranged from $3-5 AUD ($2.30 -$3.80 USD) for ONE. If you know me, then you know avocados are my favorite, so eating them at this price is not doable for daily consumption. Anyway, some of the ways I found to save money in the food department was to go to the Rotisserie chicken places which are everywhere. They usually have an option for half a chicken breast and 3 sides for relatively cheap. The place Kayla and Josh frequented in Bondi was $12.90 AUD ($9.84 USD) for half a chicken breast plus 3 sides. The portion was huge and accounted for two meals. This was a go to for me to save money. The Asian markets are another good option for cheap food. Other than that the food was very expensive in Sydney. I did go to Australia at a good time for the US dollar ($1 USD = $1.31 AUD). I was also very lucky with the connections I had in Australia because it made my cost on accommodation close to nothing. For travelers who might not have friends to stay with the option of couch-surfing is always available and I did find some cool profiles of people offering a place to stay. Traveling can always be affordable, if you are flexible and willing. My overall total in US dollars spent in Australia was $1589.69. On average I spent $39 dollars a day, I did splurge a little on a few gifts. I did however, live at an Ashram for 11 days which was free accommodation and food in return for volunteering. Sydney is a beautiful city. What surprised me most about Sydney is how spread out it is. It is a lot bigger than I expected. There is good transportation in Sydney from buses to trains which is nice, but I spent majority of my time staying in Bondi. Kayla and Josh lived in walking distance to Bondi beach and Bondi junction where I could catch any train. Take a walk! There are some great walks along the coast that go to the different beaches. The Bondi to Coogee walk is a beautiful one. It's 6km and passes beautiful beaches and parks. Fun fact: The sunrises over the ocean in Australia, so I'd recommend a morning walk to catch the sunrise. I'm used to seeing the sunset over the ocean, so this was a fun difference. The Establishment on Tuesday nights in Sydney offer free salsa lessons at 8pm followed by salsa dancing. I highly recommending checking this one out! To sustain my travels it is essential I find places to volunteer along my journey. The one thing I am passionate about finding is Ashrams in the countries I visit. Mangrove Ashram is located 45 mins outside of Sydney. By train it takes about 1.5 and requires a transfer at Gosford station to a bus. This place was amazing! I was able to stay here for 11 days for free and enjoyed some of the best food I had during my time in Australia. Mangrove hosts all sorts of retreats on the weekend. Check out more here. Kayla and I spent two nights camping here and had the best time! Booderee National Park has a few different campgrounds. For the nature lovers, I recommend staying at Bristol Point it is in nature and a close walk to beautiful beaches. We went camping on the weekdays so there wasn't a lot of people. Most of the time we were the only ones on the beach. Another place you can camp is Cave Beach which is a better beach for surfing and seeing kangaroos. They are everywhere! Cave Beach is a prettier beach, in my opinion, but I preferred staying at Bristol Point because of the trees. Port Stephens is 3 hours North of Sydney and is a must see. We went to Anna Bay Sand Dunes and slept on the beach for free. This isn't actually a campsite, but we were told the rangers leave at 5pm and don't return until 8am, so technically we could camp here if we were packed up before then. It was amazing! The ranger ended up coming at 7:30am, but just told us to pack up. We were able to make breakfast from our van in the parking lot. Our go to breakfast during the road trip was a sweet potato hash with capsicum (bell peppers), onions, garlic and scrambled eggs, served with avocado, tortilla and hot sauce. As yummy as breakfast was the best part was knowing we were spending less than $5 dollars a day on it. Waking up on the beach on Easter morning was one for the books. We woke up facing the ocean and continued the day at Nelson Bay hiking to the top of Summit Hill. When we made it to the top we noticed a patch of sand where the oceans meet, curious, we asked if anyone knew how to get there and were quickly informed. We drove to the other side and made the trek. It was incredible to be between two bays that were crashing into each other. The beauty we were surrounded by was out of this world. Australia offers a lot of free camping which is ideal for budget travelers. The best part of the road trip was stopping along the way at beautiful beaches and taking a dip before finding a new place to camp for the night. Not all the campsites were nice but I was definitely surprised by a few. Here's a list of free sites we stayed at along the way from Sydney to Brisbane. For campsites and accommodations you can check out this site or download the app WikiCamps Australia. Coopernook Forest Camping - This place is located 1.5 outside of Seal Rocks. It is a beautiful free campsite. One of my favorite places we stayed. Billinudgel Hotel is 25 minutes out of Byron Bay and allows people to camp for free behind the hotel. They charge $5AUD for a shower. Hugh Mountz Park and Dump Point - Surfers Paradise (This place wasn't great but it was free so we can't complain). Captain Logan Campground - an hour north of Brisbane. This was a paid campsite on a beautiful lake. Check out the last place below for more details and pictures. Everyone I have met in my travel has always told me to make sure I go to Byron Bay, I finally get why. This is a fun hippie town 1.5 hours south of Brisbane. Think beautiful beaches, incredible sunsets, great shops, farmers market and tasty oysters. The coolest community living home located between Byron Bay and Nimbin. All I can say is do yourself a favor and come here once in your life. Thank you Guy! On our last night in Australia we decided to stay at a paid campsite and celebrate the friendships we met along our journey. It was worth it! The first day of our road trip we met an English guy, Mitch, & Scottish girl, Jen, who were also traveling up the coast. We ended up spending our entire road trip together. We quickly became a travel family and made some of the best memories together. I will always cherish all the good times we had together. This road trip was one of the biggest highlights of my life and each of you added to it. Thank you for following along on my journey! Namaste.